Received: October 30, 2018; Published online: January 31, 2019. The loss of skeletal muscle, called sarcopenia, is an inevitable event during the aging process, and significantly impacts quality of life. Autophagy is known to reduce muscle atrophy caused by dysfunctional organelles, even though the molecular mechanism remains unclear. Here, we have discuss the current understanding of exercise-induced autophagy activation in skeletal muscle regeneration and remodeling, leading to sarcopenia intervention. With aging, dysregulation of autophagy flux inhibits lysosomal storage processes involved in muscle biogenesis. AMPK-ULK1 and the FoxO/PGC-1α signaling pathways play a critical role in the induction of autophagy machinery in skeletal muscle, thus these pathways could be targets for therapeutics development. Autophagy has been also shown to be a critical regulator of stem cell fate, which determines satellite cell differentiation into muscle fiber, thereby increasing muscle mass. This review aims to provide a comprehensive understanding of the physiological role of autophagy in skeletal muscle aging and sarcopenia. Skeletal muscle, comprising about 40% of our body mass, is the most abundant tissue and a major metabolic organ in humans (1). Imbalances of protein homeostasis, more protein degradation than corresponding synthesis with aging, lead to skeletal muscle loss, or sarcopenia (2, 3). Therefore, skeletal muscle needs an efficient process for recycling damaged or aged organelles to meet the energy demands of the body (Fig. 1). Protein degradation in skeletal muscle is controlled by two proteolytic systems, the ubiquitin proteasome and the autophagy lysosome. Autophagy is vital for breaking down lysosomal nutrient stores in order to reconstruct cellular architecture using damaged cellular components. The restriction of amino acids has been shown to induce an activation of autophagy and proteolysis in C2C12 myotubes, through an mTOR-independent signaling pathway (4). Autophagy activation by nutrient starvation has been observed in gastrocnemius, extensor digitorum longus, and soleus muscles using transgenic mice expressing GFP fused to microtubule-associated protein 1 light chain 3 (GFP-LC3) (5). LC3 is also overexpressed in muscle atrophy states, such as cachexia, diabetes, and fasting (6). Although both excessive and defective autophagy are highly correlated with the loss of skeletal muscle (7), autophagy was first considered to be a negative regulator of myogenesis via proteolytic process enhancing loss of muscle mass. Suppression of the PI3K-Akt signaling pathway in mice muscles by fasting activated autophagy through two processes, reduction of mTOR and activation of FOXO3 (8). Additionally, autophagy was negatively regulated by the expression of death-associated protein 1 (DAP1), a novel substrate of mTOR (9). Overexpression of DAP1 augmented creatine kinase activity, myoblast fusion, and myotube diameters, while knockdown expression significantly suppressed them during differentiation in chicken satellite cells (10). Many studies have shown that autophagy activation has a critical role in muscle performance. This review highlights the involvements of autophagy activation in muscle regeneration by the differentiation of satellite cells and in various exercise training regimens, such as resistance, endurance, and habitual exercise to increase muscle performance. Autophagy has been widely implicated in many pathophysiological processes, including cancer, metabolic disorders, and neurodegenerative diseases, as well as muscle dystrophy. It also plays an important role in aging and exercise (11). Autophagy is a protective mechanism that allows cells to survive in response to nutritional deprivation or intracellular pathogens, and is well conserved in organisms ranging from yeast to mammals (12). Autophagy is active, even at basal levels in most cell types where it is postulated to play a housekeeping role in maintaining the integrity of intracellular organelles (13). Recent studies have shown that the key role of autophagy is to keep cells alive under stressful conditions. There are three defined types of autophagy, macroautophagy, microautophagy, and chaperone-mediated autophagy, all of which promote proteolytic degradation of cytosolic components at the lysosome. Here, macroautophagy is referred to as autophagy. To maintain nutrient and energy homeostasis, regulation of autophagy formation is tightly controlled. The process of autophagy begins with an expanding membrane structure known as phagophore, which leads to formation of a double-membrane vesicle, called an autophagosome. Autophagosomes are subsequently fused with lysosomes, in which the autophagosome is degraded, and the resulting molecules are used in the recycling process. Two complexes containing the class III phosphatidylinositol 3-kinase (PI3K) and vacuolar protein sorting 34 (Vps34) or a serine/threonine kinase autophagy-related gene 1 (Atg1) and unc-51-like kinase 1 (Ulk1) are known to initiate autophagosome formation. Starving inactivates the mammalian target of rapamycin complex 1 (mTORC1), so AMP-activated kinase (AMPK) phosphorylates Ulk1 at Ser317 and Ser777 (14). AMPK also inhibits mTORC1 directly by two mechanisms, phosphorylation of TSC2 and Raptor (15, 16). On the other hand, under nutrient-rich conditions, mTORC1 phosphorylates Ulk1 at Ser757, to inhibit autophagy initiation (Fig. 2). Recently, many studies have reported that autophagy preserves muscle mass, as well as functionally enhancing muscle strength. Muscle stem cells, called satellite cells, in adult muscles can also provide new myofibers in the damaged area (17). Autophagy occurring by the activation of satellite cells in response to muscle injury has been reported to contribute to the early compensatory regenerations of dystrophic muscles (18). Autophagy has also been induced during satellite cell transition from quiescence to activation. Blocking of autophagy prevents satellite cell activation, suggesting that autophagy might support subcellular organelles required during satellite cell activation (19). They reside in a quiescent state between the basal lamina and the sarcolemma of muscle fibers, where they proliferate and differentiate via asymmetric divisions to become muscle fibers. Autophagy also has been involved in mitochondrial biogenesis and myotube fusion in the early and late stage of differentiation. Dysregulation of autophagic flux by pharmacological and genetic interferences suppresses the degradation of mitochondria immediately after differentiation (20). The reduced fusion index by the downregulation of beclin 1, an activator of Vps34, suggests that autophagy is necessary for myotube fusion in the last stages of differentiation (21). A recent study on sarcopenia reported that dysregulation of CDKN2A/p16(INK4a) caused satellite cells to lose the ability to maintain a reversible quiescent state (22). Stress, such as a loss of proteostasis, an increase in oxidative stress, and mitochondrial impairment have been shown to induce senescence in aged satellite cells with dysfunctional autophagy, as well in as young cells with genetically defective autophagy, leading to a decrease in number and function of the satellite cells (23). Autophagy also could be a critical regulator of stem cell fate in sarcopenia, reversing satellite cell senescence and restoring regeneration activity. The functions of autophagy have been extended to removal of defective and excessive proteins or organelles, indicating that autophagy is able to control molecular activities essential for stem cell differentiation (24, 25). The positive roles of autophagy have been described as maintenance of muscle mass and strengthening of muscle fibers regenerated from satellite cells. Exercise has been implicated in the regulation of autophagy in many tissues, but skeletal muscle has been the main focus. It is thought that increased activation of the AMPK pathway and its downstream effector, ULK1 induces autophagy flux in human skeletal muscle during exercise. This process depends on the intensity of exercise, rather than the nutritional state (26). Autophagy is required for muscle integrity. Muscle-specific Atg7-null mice display muscle wasting caused by impairment of force transmission, accumulation of dysfunctional mitochondria, and formation of aberrant concentric membranous structures (1). Collagen VI-knockout mice (Col6a1−/−) have muscular dystrophy, with dysfunctional mitochondria and spontaneous apoptosis in skeletal muscle, which are associated with the down-regulation of beclin-1 and Bnip3, and the decrease of autophagosomes (27). In this model, restoration of autophagy by transfection of beclin-1 construct, low-protein diet, or treatment of rapamycin ameliorated the pathological phenotypes. Long-term voluntary exercise caused myofiber damage in autophagy-defective mutant mice (Col6a1−/−), but not in wild type mice (28). This finding suggests that autophagy activation contributes to the maintenance of skeletal muscle homeostasis during physical activity (Fig. 2). Autophagy however, is not involved in skeletal muscle contraction in inducible muscle-specific atg7 knockout mice when autophagy is inhibited just before treadmill exercise to minimize the chance of muscle adaptation and compensation (29). Of interest, fiber-type shifting from type IIX to IIA in plantaris and gastrocnemius muscles after 5 months of habitual exercise indicated that muscle adaptation is associated with increased expression of LC3-II (30). AMPKα2 knockout mice and autophagy inhibitor 3-methyladenine have been used to show that acute or chronic exercise activates autophagy (31). Exercise-induced phosphorylation of AMPK mediates autophagy activation, which may contribute to beneficial metabolic effects, such as enhanced glucose uptake in skeletal muscle. Voluntary wheel-running exercises for 5 weeks showed greater increases in skeletal muscle basal autophagy flux, expressions of autophagy proteins, mitochondrial biogenesis, capillary density, and endurance capacity in wild type mice, compared to Atg6 (Atg6+/−) heterozygous mice (32). This result strongly suggests that enhancement of basal autophagy flux might play an essential role in skeletal muscle adaptation and in physical performance enhancement upon endurance exercise training (Fig. 3). The contribution of high-intensity interval training than continuous moderate-intensity training has been related with improved autophagic adaptation in rat cardiac muscles (33) and skeletal muscles (34). Cytotoxic processes caused by autophagy deficiency is cell-type specific in mice. Ubiquitin- and LC3-binding protein p62 accumulation induced liver injury in Atg7F/F mutant mice by controlling cytoplasmic inclusion body formation (35). Long-term resistance exercise training increases maximal capacity carrying lead weights through p62-mediated autophagy activity in chloroquine-induced rat myopathy (36). The results present the therapeutic possibility that long-term resistance exercise training has a role in muscle-related disease conditions, where it might be used to improve muscle function and strength by promoting autophagy activity. Aging accelerates skeletal muscle loss, called sarcopenia. Since skeletal muscle manages not only physical activity, but also metabolism, circulation and cognition, sarcopenia threatens a healthy lifespan. With society aging worldwide, the prevalence of sarcopenia increases the urgent need to establish prevention and intervention strategies. In agreement with a protective role of autophagy during skeletal muscle aging, several findings have indicated that autophagy becomes progressively dysfunctional in aging muscles of rodents and humans. A couple of mechanisms contribute to the progressive age-related decline of autophagy formation in rodents, including decreased autophagy gene expression and lower autophagy levels (37). Perrimon (38) suggested that preserving autophagy during skeletal muscle aging protects flies from developing age-related skeletal muscle dysfunction and extends lifespan via the FoxO/4E-BP signaling pathway. Resistance exercise training has been known to effectively increase muscle mass, while more efficient protein synthesis was seen in younger age groups than in older adults (39), with increased activation of key proteins such as mTOR, S6K, 4E-BP, and ERK1/2 in protein anabolic pathways. Moreover, acute resistance exercise exerted the same effects on muscle protein degradation and autophagy activation in younger and older adults (40). Results of studies on autophagy induction in skeletal muscle during aging have yielded contradictory results. Autophagy induction was increased in some studies (41, 42), and decreased in others (43, 44), even though autophagy activity was decreased with aging in invertebrates and higher organisms (45). However, a recent investigation implicated dysregulation of autophagy as a critical inducer of sarcopenia (46). Many studies have suggested that exercise training activates the autophagy pathway, leading to increased muscle mass and function. Chronic resistance exercise training has been reported to induce beneficial effects on aged skeletal muscle to improve muscle strength and reduce muscle loss via activation of autophagy (47). Nine weeks of resistant exercise training increased autophagy activity, IGF-1/IGF-1R expression, AMPK expression, and the phosphorylation of AMPK and FOXO3a, but inhibited the phosphorylation of Akt and mTOR, and the activity of caspase 3 associated with apoptosis. LC3-II/LC3-I ratio and p62 protein levels were reduced, while expression of beclin-1, Atg5/12, and Atg7 were increased. Interestingly, the increased expression levels of IGF-1/IGF-1R induced by chronic resistance exercise may contribute to proliferation of satellite cells and inhibition of apoptosis. Atg7 and beclin-1 expression were decreased with aging in extensor digitorum longus. Their expression increased after exercise, and muscle mass was also increased in the gastrocnemius muscle of old trained mice (48). In addition to identification of autophagic molecular impact on skeletal muscle aging, several physiological effects of exercises have been examined. Long-term voluntary resistance exercise in mid-life (15 months in mice) enhanced the autophagy pathway and suppressed sarcopenic phenotype in hindlimb mouse muscle, and caused soleus muscle hypertrophy, compared with same age sedentary controls (49). Exercise training coupled with spermidine treatment suppresses skeletal muscle atrophy by improving autophagy in the aging rat model (50). Moreover, acute exercise activates the autophagy pathway and increases insulin sensitivity in skeletal muscles of old mice (51). 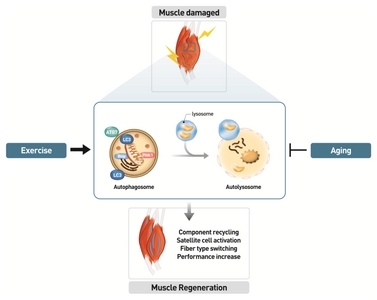 Both endurance and resistance exercise may prevent age-related muscle wasting and be a therapeutic intervention for sarcopenia through improvement of autophagy. Recent studies have revealed that exercise-induced autophagy activation in skeletal muscle depends on its intensity and duration. Endurance exercise induces metabolic adaptation in muscles, while resistance exercise increases muscle mass. However, the involvement of autophagy activation in fiber type switching is not clear in the endurance exercise. Experimental results have not shown whether endurance exercise induces satellite cell activation through the autophagic pathway. It is clear that animal models for resistance exercise, rather than endurance exercise need to be established. Even though most experiments described here have been carried out in the autophagy deficient models, many questions remain. 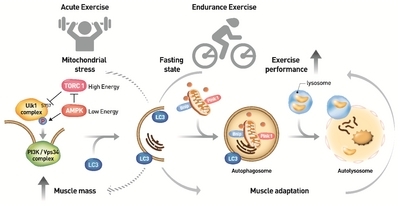 Is autophagy activation induced by endurance or resistance exercise always beneficial? If not, what mechanism regulates it? Additional studies of exercise-induced autophagic effects on muscle performance in animals and humans will help provide answers to these questions. Taken together, autophagy has emerged as a new and potent modulator of muscle-related disease progression, that is both scientifically intriguing and clinically relevant. Autophagy activation by exercise has been found to enhance muscle performance and improve sarcopenic phenotype. The autophagy response plays critical roles in the differentiation of satellite cells, increase in muscle mass, and adaptation in old age. The reactions take place in long-term and acute modes, with and without transcription activation, respectively. Exercise-induced autophagy could be a target of sarcopenia treatment, whereas autophagy activation by caloric restriction or oxidative stress might not be beneficial for skeletal muscle homeostasis. The catabolic pathways outweigh the anabolic process with aging. mTOR inhibits autophagy induction, but activates muscle protein synthesis. FoxO induces not only autophagy, but also the ubiquitin-proteasome system. The IGF-Akt-mTOR signaling axis negatively regulates FoxO. Moreover, AMPK triggers autophagy through inhibition of mTOR in a FoxO-dependent or -independent manner (52, 53). Thus ubiquitin-dependent proteolysis by atrogin-1 and MuRF-1 and mTOR-dependent biosynthesis should be considered as therapeutic interventions for autophagy activation in old age. The complete regulation networks of AMPK-mTOR-FoxO must be considered because excessive activation of autophagy deteriorates skeletal muscle mass (54). Microautophagy and chaperone-mediated autophagy are also important because of the pathways connected to and metabolic substrates shared with autophagy. This study was supported by grants from the BioMedical Technology Development Program (2017M3A9D8048708) of the National Research Foundation (NRF) funded by the Korean government (Ministry of Science and ICT) and the KRIBB Research Initiative Program. Fig. 1. Age-related autophagy and muscle degeneration in skeletal muscle. Autophagy normally functions as a physiological process to degrade cytoplasmic aggregates, or organelles. Aging in skeletal muscle can result in an imbalance of muscle mass and strength. Not only autophagy defect is closely linked to the loss of muscle in aging, but muscle degeneration with aging results from decreases in both number and size of muscle fibers. Fig. 2. Molecular mechanism of autophagy induction by exercise in skeletal muscle. Nutrient depletion and low energy are well established autophagy inducers. Both mTORC1 inhibition and AMPK activation regulate the Ulk1 complex through a series of phosphorylation events leading to form a sequestering membrane called phagophore. LC3 conjugates to the sequestering membrane and controls the elongation of the phagophore, in which cytoplasmic organelles such as mitochondria and endoplasmic reticulum and aggregated proteins are occupied. PINK1-parkin complex and Bnip factors are required for removal of dysfuncional mitochondria. At the end of elongation, sequestering membrane closes and results in the formation of a double-membrane vesicle, autophagosome. Lysosomes ultimately fuse with autophagosomes releasing lysosomal hydrolases into the vesicle resulting in the degradation of its contents. An imperfect autophagy may contribute to the abnormal clearance of intracellular aggregates in skeletal muscle aging and lead to muscle loss. Endurance exercise-induced AMPK activation initiates autophagy induction. Upregulation of the early stage-initiating enzyme ATG7 by endurance exercise increases autophagy flux, thereby enhancing muscle performance. On the other hand, speculatively, the acute exercise might stimulate protein translation via mTORC1, thereby increasing muscle mass (broken arrow). However, the association between the acute exercise and autophagy formation needs further investigations in vivo. Fig. 3. Role of autophagy in skeletal muscle performance. Autophagy might carry out basic functions such as component recycling and energy support in skeletal muscle. Aging inhibits autophagy formation in skeletal muscle through multiple factors such as accumulation of misfolded proteins or dysfunctional mitochondria. In order to repair muscle damage, the exercise is required to induce autophagy, which results satellite cell activation, muscle mass maintenance, fiber type switching, and muscle adaptation. Autophagy formation might be beneficial event for the muscle performance through regeneration and remodeling in skeletal muscle. Masiero E, Agatea L, and Mammucari C (2009) Autophagy is required to maintain muscle mass. Cell metab 10, 507-515. Park SS, Kwon E-S, and Kwon K-S (2017) Molecular mechanisms and therapeutic interventions in sarcopenia. Osteoporosis and Sarcopenia 3, 117-122. Kwak JY, Hwang H, and Kim SK (2018) Prediction of sarcopenia using a combination of multiple serum biomarkers. Sci Rep 8, 8574. Mordier S, Deval C, Bechet D, Tassa A, and Ferrara M (2000) Leucine limitation induces autophagy and activation of lysosome-dependent proteolysis in C2C12 myotubes through a mammalian target of rapamycin-independent signaling pathway. J Biol Chem 275, 29900-29906. Mizushima N, Yamamoto A, Matsui M, Yoshimori T, and Ohsumi Y (2004) In vivo analysis of autophagy in response to nutrient starvation using transgenic mice expressing a fluorescent autophagosome marker. Mol Biol Cell 15, 1101-1111. Lecker SH, Jagoe RT, and Gilbert A (2004) Multiple types of skeletal muscle atrophy involve a common program of changes in gene expression. FASEB J 18, 39-51. Petrovski G, and Das DK (2010) Does autophagy take a front seat in lifespan extension?. J Cell Mol Med 14, 2543-2551. Zhao J, Brault JJ, and Schild A (2007) FoxO3 coordinately activates protein degradation by the autophagic/lysosomal and proteasomal pathways in atrophying muscle cells. Cell Metab 6, 472-483. Koren I, Reem E, and Kimchi A (2010) DAP1, a novel substrate of mTOR, negatively regulates autophagy. Curr Biol 20, 1093-1098. Shin J, McFarland DC, Strasburg GM, and Velleman SG (2013) Function of death-associated protein 1 in proliferation, differentiation, and apoptosis of chicken satellite cells. Muscle Nerve 48, 777-790. Choi AM, Ryter SW, and Levine B (2013) Autophagy in human health and disease. N Engl J Med 368, 651-662. Glick D, Barth S, and Macleod KF (2010) Autophagy: cellular and molecular mechanisms. J Pathol 221, 3-12. Mizushima N, Yoshimori T, and Levine B (2010) Methods in mammalian autophagy research. Cell 140, 313-326. Gallagher LE, Williamson LE, and Chan EY (2016) Advances in Autophagy Regulatory Mechanisms. Cells 5, 24. Gwinn DM, Shackelford DB, and Egan DF (2008) AMPK phosphorylation of raptor mediates a metabolic checkpoint. Mol Cell 30, 214-226. Inoki K, Zhu T, and Guan KL (2003) TSC2 mediates cellular energy response to control cell growth and survival. Cell 115, 577-590. Le Grand F, and Rudnicki MA (2007) Skeletal muscle satellite cells and adult myogenesis. Curr Opin Cell Biol 19, 628-633. Fiacco E, Castagnetti F, and Bianconi V (2016) Autophagy regulates satellite cell ability to regenerate normal and dystrophic muscles. Cell Death Differ 23, 1839-1849. Tang AH, and Rando TA (2014) Induction of autophagy supports the bioenergetic demands of quiescent muscle stem cell activation. EMBO J 33, 2782-2797. Sin J, Andres AM, and Taylor DJ (2016) Mitophagy is required for mitochondrial biogenesis and myogenic differentiation of C2C12 myoblasts. Autophagy 12, 369-380. Fortini P, Ferretti C, and Iorio E (2016) The fine tuning of metabolism, autophagy and differentiation during in vitro myogenesis. Cell Death Dis 7, e2168. Sousa-Victor P, Gutarra S, and Garcia-Prat L (2014) Geriatric muscle stem cells switch reversible quiescence into senescence. Nature 506, 316-321. Garcia-Prat L, Martinez-Vicente M, and Perdiguero E (2016) Autophagy maintains stemness by preventing senescence. Nature 529, 37-42. Knuppertz L, and Osiewacz HD (2016) Orchestrating the network of molecular pathways affecting aging: Role of nonselective autophagy and mitophagy. Mech Ageing Dev 153, 30-40. Levine B, and Kroemer G (2008) Autophagy in the pathogenesis of disease. Cell 132, 27-42. Schwalm C, Jamart C, and Benoit N (2015) Activation of autophagy in human skeletal muscle is dependent on exercise intensity and AMPK activation. FASEB J 29, 3515-3526. Grumati P, Coletto L, and Sabatelli P (2010) Autophagy is defective in collagen VI muscular dystrophies, and its reactivation rescues myofiber degeneration. Nat Med 16, 1313-1320. Grumati P, Coletto L, and Schiavinato A (2011) Physical exercise stimulates autophagy in normal skeletal muscles but is detrimental for collagen VI-deficient muscles. Autophagy 7, 1415-1423. Lo Verso F, Carnio S, Vainshtein A, and Sandri M (2014) Autophagy is not required to sustain exercise and PRKAA1/AMPK activity but is important to prevent mitochondrial damage during physical activity. Autophagy 10, 1883-1894. Tam BT, Pei XM, and Yu AP (2015) Autophagic adaptation is associated with exercise-induced fibre-type shifting in skeletal muscle. Acta physiologica 214, 221-236. Liu X, Niu Y, Yuan H, Huang J, and Fu L (2015) AMPK binds to Sestrins and mediates the effect of exercise to increase insulin-sensitivity through autophagy. Metabolism 64, 658-665. Lira VA, Okutsu M, and Zhang M (2013) Autophagy is required for exercise training-induced skeletal muscle adaptation and improvement of physical performance. FASEB J 27, 4184-4193. Li FH, Li T, Su YM, Ai JY, Duan R, and Liu TC (2018) Cardiac basal autophagic activity and increased exercise capacity. J Physiol Sci 68, 729-742. Li FH, Li T, and Ai JY (2018) Beneficial Autophagic Activities, Mitochondrial Function, and Metabolic Phenotype Adaptations Promoted by High-Intensity Interval Training in a Rat Model. Front Physiol 9, 571. Komatsu M, Waguri S, and Koike M (2007) Homeostatic levels of p62 control cytoplasmic inclusion body formation in autophagy-deficient mice. Cell 131, 1149-1163. Kwon I, Lee Y, Cosio-Lima LM, Cho JY, and Yeom DC (2015) Effects of long-term resistance exercise training on autophagy in rat skeletal muscle of chloroquine-induced sporadic inclusion body myositis. J Exerc Nutrition Biochem 19, 225-234. Sebastian D, Sorianello E, and Segales J (2016) Mfn2 deficiency links age-related sarcopenia and impaired autophagy to activation of an adaptive mitophagy pathway. EMBO J 35, 1677-1693. Demontis F, and Perrimon N (2010) FOXO/4E-BP signaling in Drosophila muscles regulates organism-wide proteostasis during aging. Cell 143, 813-825. Fry CS, Drummond MJ, and Glynn EL (2011) Aging impairs contraction-induced human skeletal muscle mTORC1 signaling and protein synthesis. Skelet Muscle 1, 11. Fry CS, Drummond MJ, and Glynn EL (2013) Skeletal muscle autophagy and protein breakdown following resistance exercise are similar in younger and older adults. J Gerontol A Biol Sci Med Sci 68, 599-607. Halling JF, Ringholm S, Olesen J, Prats C, and Pilegaard H (2017) Exercise training protects against aging-induced mitochondrial fragmentation in mouse skeletal muscle in a PGC-1alpha dependent manner. Exp Gerontol 96, 1-6. O’Leary MF, Vainshtein A, Iqbal S, Ostojic O, and Hood DA (2013) Adaptive plasticity of autophagic proteins to denervation in aging skeletal muscle. Am J Physiol Cell Physiol 304, C422-430. Carnio S, LoVerso F, and Baraibar MA (2014) Autophagy impairment in muscle induces neuromuscular junction degeneration and precocious aging. Cell Rep 8, 1509-1521. Russ DW, Krause J, Wills A, and Arreguin R (2012) “SR stress” in mixed hindlimb muscles of aging male rats. Biogerontology 13, 547-555. Cuervo AM, Bergamini E, Brunk UT, Droge W, Ffrench M, and Terman A (2005) Autophagy and aging: the importance of maintaining “clean” cells. Autophagy 1, 131-140. Fan J, Kou X, Jia S, Yang X, Yang Y, and Chen N (2016) Autophagy as a Potential Target for Sarcopenia. J Cell Physiol 231, 1450-1459. Luo L, Lu AM, and Wang Y (2013) Chronic resistance training activates autophagy and reduces apoptosis of muscle cells by modulating IGF-1 and its receptors, Akt/mTOR and Akt/FOXO3a signaling in aged rats. Exp Gerontol 48, 427-436. Kim YA, Kim YS, Oh SL, Kim HJ, and Song W (2013) Autophagic response to exercise training in skeletal muscle with age. J Physiol Biochem 69, 697-705. White Z, Terrill J, and White RB (2016) Voluntary resistance wheel exercise from mid-life prevents sarcopenia and increases markers of mitochondrial function and autophagy in muscles of old male and female C57BL/6J mice. Skelet Muscle 6, 45. Fan J, Yang X, and Li J (2017) Spermidine coupled with exercise rescues skeletal muscle atrophy from D-gal-induced aging rats through enhanced autophagy and reduced apoptosis via AMPK-FOXO3a signal pathway. Oncotarget 8, 17475-17490. Lenhare L, Crisol BM, and Silva VRR (2017) Physical exercise increases Sestrin 2 protein levels and induces autophagy in the skeletal muscle of old mice. Exp Gerontol 97, 17-21. Milan G, Romanello V, and Pescatore F (2015) Regulation of autophagy and the ubiquitin-proteasome system by the FoxO transcriptional network during muscle atrophy. Nat Commun 6, 6670. Vainshtein A, and Hood DA (2016) The regulation of autophagy during exercise in skeletal muscle. J Appl Physiol 120, 664-673. Dalle Pezze P, Ruf S, and Sonntag AG (2016) A systems study reveals concurrent activation of AMPK and mTOR by amino acids. Nat Commun 7, 13254.